Sir Terry Pratchett first came up with the idea of the Long Earth multiverse back in 1986. He set it aside to focus on Discworld. The 75 million copies sold of those wildly popular fantasy novels would indicate that this was a pretty good idea. Even the Queen of England agrees. Yearning for the sort of cutting-edge dystopian future we were promised way back in the 1980s? Simon Morden's Equations of Life may be just the cyberpunk thriller for you. These days in Speculative Fiction it's all about the Fantasy; Urban, Epic, or Weird. What happened to all the spaceships? Take heart space cadets, Greg Bear delivers cosmic wonder — and terror — with his latest novel, Hull Zero Three. Just in time for Passover, Tachyon Publications presents The Kosher Guide to Imaginary Animals. This slim and silly volume is the ideal gift for anyone who has tried to make a saving throw vs. petrification using a dreidel. This past Sunday, Kage Baker lost her year-long battle with cancer. 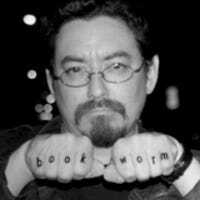 We science-fiction readers have lost a brilliant author and a dear friend. Magical Dogs and Detectives Explore Supernatural San Francisco in "Unleashed"
Forthcoming urban fantasy Unleashed (Ace) by John Levitt is the sequel to Dog Days and New Tricks. It follows the exploits of a spell-casting jazz guitarist and his magic doggie. Well, sort of a doggie. Tachyon Publications has a new anthology out called The Secret History of Science Fiction. It centers around a subject that has sparked countless debates and rants among Science Fiction fans. And no, it's not River Tam vs. James T. Kirk. Have we gone multiverse crazy? Iain Banks' latest novel, Transition, is just the latest of a long line of sideways-traveling books, and this theme is more prevalent than ever. Here are some of my favorites, with spoilers and foul language. The Magazine Of Fantasy & Science Fiction has been at the forefront of genre short fiction for sixty years. And current editor Gordon Van Gelder had the unenviable task of choosing just 23 stories to represent those six decades. In anticipation of that upcoming movie with that guy who was in Weird Science, Night Shade Books presents The Improbable Adventures of Sherlock Holmes. The game is afoot! Or perhaps atentacle. Goggles, gaslights and gears, oh my! Steampunk is a steadily growing subgenre of speculative fiction. We review four current and forthcoming books that have been affixed with that label... in an elegant copperplate hand, naturally. Joe R. and Keith Lansdale present another collection of stories recalling those hard-boiled cheap thrills from the first half of the last century. Hearken back with us now to yesteryear in Son of Retro Pulp Tales! (Subterranean Press). The last 25 years has seen a huge swell of interest by English-speaking audiences in manga, partly thanks to Viz Media. Now Viz is publishing translations of two prose novels, about alien invasion, time travel and power-armor smackdowns. Bar None by Tim Lebbon (Night Shade Press, 2009) is a dark post-apocalyptic fantasy with a creepy numinous beauty and really good beer. End of the world, everybody, last orders if you please.